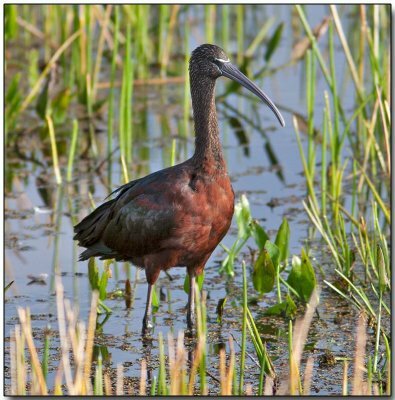 Glossy ibises feed in very shallow water and nest in freshwater or brackish wetlands with tall dense stands of emergent vegetation such as reeds, papyrus or rushes) and low trees or bushes. The diet of the glossy ibis is variable according to the season and is very dependent on what is available. Prey includes adult and larval insects such as aquatic beetles, dragonflies, damselflies, grasshoppers, crickets, flies and caddisflies, Annelida including leeches, molluscs (e.g. snails and mussels), crustaceans (e.g. crabs and crayfish) and occasionally fish, amphibians, lizards, small snakes and nestling birds.